Copyright © 2013 W3C® (MIT, ERCIM, Keio), All Rights Reserved. W3C liability, trademark and document use rules apply. The working groups maintains a list of all bug reports that the editors have not yet tried to address. This draft highlights some of the pending issues that are still to be discussed in the working group. No decision has been taken on the outcome of these issues including whether they are valid. Provide byte stream definitions for WebM, the ISO Base Media File Format, and MPEG-2 Transport Streams. The byte stream format specifications contain format specific examples. A series of appendArrayBuffer() or appendStream() calls on a SourceBuffer without any intervening abort() calls. The media segments in an append sequence must be adjacent and monotonically increasing in time without any gaps. An abort() call starts a new append sequence which allows media segments to be appended in non-monotonically increasing order. 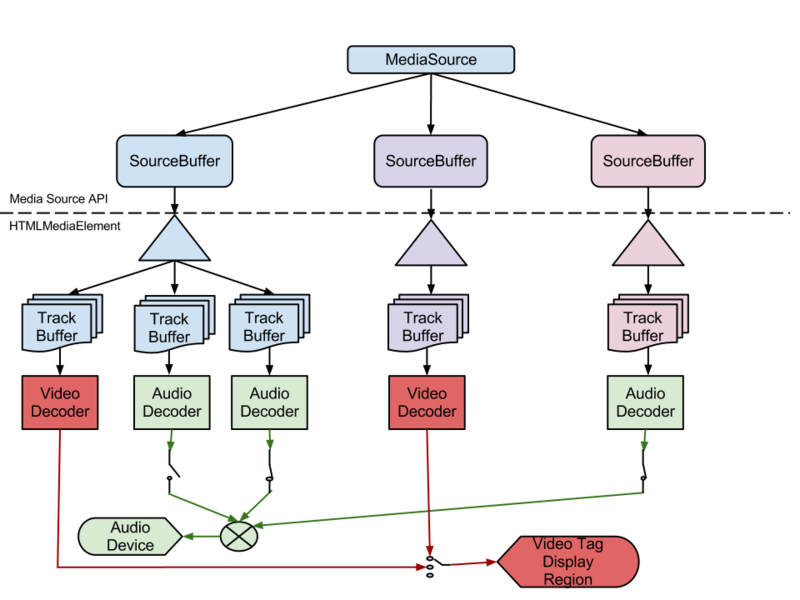 Contains the subset of sourceBuffers that are providing the selected video track, the enabled audio tracks, and the "showing" or "hidden" text tracks. If the updating attribute equals true on any SourceBuffer in sourceBuffers, then throw an INVALID_STATE_ERR exception and abort these steps. appendArrayBuffer(), appendStream() and endOfStream() can update the duration under certain circumstances. Notify the media element that it now has all of the media data. Playback should continue until all the media passed in via appendArrayBuffer() and appendStream() has been played. Check to see whether the MediaSource is capable of creating SourceBuffer objects for the the specified MIME type. If type contains at a codec that the MediaSource does not support, then return false. Abort the stream append loop algorithm if it is running. Set the the sourceBuffer attribute in all tracks in sourceBuffer.audioTracks, sourceBuffer.videoTracks, and sourceBuffer.textTracks to null. Remove all the tracks in sourceBuffer.audioTracks, sourceBuffer.videoTracks, and sourceBuffer.textTracks from the respective audioTracks, videoTracks, and textTracks attributes on the HTMLMediaElement. Remove all the tracks in sourceBuffer.audioTracks, sourceBuffer.videoTracks, and sourceBuffer.textTracks and queue a task to fire a simple event named removetrack at the modified lists. Queue a task to fire a simple event named removetrack at the HTMLMediaElement track lists that were modified. If the selected video track was removed from the videoTracks attribute on the HTMLMediaElement in a step above, then queue a task to fire a simple event named change at the videoTracks attribute. If an enabled audio track was removed from the audioTracks attribute on the HTMLMediaElement in a step above, then queue a task to fire a simple event named change at the audioTracks attribute. If a TextTrack with its mode attribute set to "showing" or "hidden" was removed from the textTracks attribute on the HTMLMediaElement in a step above, then queue a task to fire a simple event named change at the textTracks attribute. Allow the resource fetch algorithm to progress based on data passed in via appendArrayBuffer() and appendStream(). The media element waits for the necessary media segments to be passed to appendArrayBuffer() or appendStream(). The following steps are periodically run during playback to make sure that all of the SourceBuffer objects in activeSourceBuffers have enough data to ensure uninterrupted playback. Appending new segments and changes to activeSourceBuffers also cause these steps to run because they affect the conditions that trigger state transitions. When the media element needs more data, it should transition from HAVE_ENOUGH_DATA to HAVE_FUTURE_DATA early enough for a web application to be able to respond without causing an interruption in playback. For example, transitioning when the current playback position is 500ms before the end of the buffered data gives the application roughly 500ms to append more data before playback stalls. If the new duration is less than old duration, then call remove(new duration, old duration) on all objects in sourceBuffers. If the updating attribute equals true, then throw an INVALID_STATE_ERR exception and abort these steps. Indicates whether an appendArrayBuffer(), appendStream(), or remove() operation is still being processed. Appends the segment data in an ArrayBuffer to the source buffer. If the buffer full flag equals true, then throw a QUOTA_EXCEEDED_ERR exception and abort these step. The web application must use remove() to free up space in the SourceBuffer. Asynchronously run the segment parser loop algorithm. When the segment parser loop returns control to this algorithm, run the remaining steps. Appends segment data to the source buffer from a Stream. If stream is null then throw an INVALID_ACCESS_ERR exception and abort these steps. If this track buffer has a random access point timestamp that is greater than or equal to end, then update remove end timestamp to that timestamp. Each track buffer has a last decode timestamp variable that stores the decode timestamp of the last coded frame appended in the current append sequence. The variable is initially unset to indicate that no coded frames have been appended yet. Each track buffer has a highest presentation timestamp variable that stores the highest presentation timestamp encountered in a coded frame appended in the current append sequence. The variable is initially unset to indicate that no coded frames have been appended yet. The input buffer is a byte buffer that is used to hold unparsed bytes across appendArrayBuffer() and appendStream() calls. The buffer is empty when the SourceBuffer object is created. The buffer full flag keeps track of whether appendArrayBuffer() or appendStream() is allowed to accept more bytes. It is set to false when the SourceBuffer object is created and gets updated as data is appended and removed. If the input buffer starts with bytes that violate the byte stream format specifications, then run the append error algorithm and abort this algorithm. If the first initialization segment flag is false, then run the append error algorithm and abort this algorithm. If the input buffer does not contain a complete media segment header yet, then jump to the need more data step below. Unset the highest presentation timestamp on all track buffers. Need a way to convey error information. When a Stream is passed to appendStream(), the following steps are run to transfer data from the Stream to the SourceBuffer. This algorithm is initialized with the stream and maxSize parameters from the appendStream() call. If stream has been aborted, then run the append error algorithm and abort this algorithm. If stream has been closed, then jump to the loop done step below. If the buffer full flag equals true, then run the append error algorithm and abort this algorithm. Read up to bytesLeft bytes from stream into data. Subtract the number of bytes in data from bytesLeft. Read all available bytes in stream into data. If an error occured while reading from stream, then run the append error algorithm and abort this algorithm. Each SourceBuffer object has an internal first initialization segment flag that tracks whether the first initialization segment has been appended. This flag is set to false when the SourceBuffer is created and updated by the algorithm below. If the initialization segment has no audio, video, or text tracks, then call endOfStream("decode") and abort these steps. Verify the following properties. If any of the checks fail then call endOfStream("decode") and abort these steps. Queue a task to fire a simple event named addtrack at audioTracks attribute on this SourceBuffer object. Queue a task to fire a simple event named addtrack at the audioTracks attribute on the HTMLMediaElement. Queue a task to fire a simple event named addtrack at videoTracks attribute on this SourceBuffer object. Queue a task to fire a simple event named addtrack at the videoTracks attribute on the HTMLMediaElement. Let new text track be a new TextTrack object with its properties populated with the appropriate information from the initialization segment. Queue a task to fire a simple event named addtrack at textTracks attribute on this SourceBuffer object. Queue a task to fire a simple event named addtrack at the textTracks attribute on the HTMLMediaElement. Set first initialization segment flag to true. If one or more objects in sourceBuffers have first initialization segment flag set to false, then abort these steps. Implementations don't have to internally store timestamps in a double precision floating point representation. This representation is used here because it is the represention for timestamps in the HTML spec. The intention here is to make the behavior clear without adding unnecessary complexity to the algorithm to deal with the fact that adding a timestampOffset may cause a timestamp rollover in the underlying timestamp representation used by the bytestream format. Implementations can use any internal timestamp representation they wish, but the addition of timestampOffset should behave in a similar manner to what would happen if a double precision floating point representation was used. Let track buffer equal the track buffer that the coded frame should be added to. If last decode timestamp for track buffer is set and decode timestamp is less than last decode timestamp or the difference between decode timestamp and last decode timestamp is greater than 100 milliseconds, then call endOfStream("decode") and abort these steps. These checks trigger an error when the application attempts out-of-order appends without an intervening abort(). Let overlapped frame be the coded frame in track buffer that contains presentation timestamp. If track buffer contains audio coded frames, then run the audio splice frame algorithm and if a splice frame is returned, assign it to spliced frame. If track buffer contains video coded frames and presentation timestamp is less than 1 microsecond beyond the presentation timestamp of overlapped frame, then remove overlapped frame and any coded frames that depend on it from track buffer. Remove all coded frames from track buffer that have a presentation timestamp greater than highest presentation timestamp and less than or equal to frame end timestamp. Remove all coded frames from track buffer that have decoding dependencies on the coded frames removed in the previous step. For example if an I-frame is removed in the previous step, then all P-frames & B-frames that depend on that I-frame should be removed from track buffer. This makes sure that decode dependencies are properly maintained during overlaps. Add spliced frame to the track buffer. If highest presentation timestamp for track buffer is unset or frame end timestamp is greater than highest presentation timestamp, then set highest presentation timestamp for track buffer to frame end timestamp. Let frame duration be the duration of new coded frame. Let overlapped frame be the coded frame in track buffer that overlaps with new coded frame (ie. it contains presentation timestamp). Round & update presentation timestamp and decode timestamp to the nearest audio sample timestamp based on sample rate of the audio in overlapped frame. The presentation time set to the overlapped frame presentation time. The decode time set to the overlapped frame decode time. The frame duration set to difference between presentation timestamp and the overlapped frame presentation time. 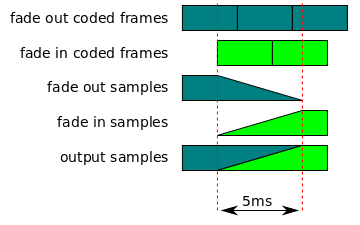 Let fade out coded frames equal overlapped frame as well as any addition frames in track buffer that overlap presentation timestamp plus the splice duration of 5 milliseconds. The frame duration set to difference between frame end timestamp and the overlapped frame presentation time. The fade in coded frame equals new coded frame. Let end timestamp be the sum of the presentation timestamp and frame duration in the last frame in fade in coded frames. Convert fade out samples and fade in samples to a common sample rate and channel layout. Apply a linear gain fade out to the samples between splice timestamp and splice end timestamp in fade out samples. Apply a linear gain fade in to the samples between splice timestamp and splice end timestamp in fade in samples. If activeSourceBuffers.length equals 0 then return an empty TimeRanges object and abort these steps. Let new intersection ranges equal the the intersection between the intersection ranges and the source ranges. Allows the web application to get and update the track kind. On getting, return the current value of the attribute. This is either the value provided when this object was created or the value provided on the last successful set operation. If the value being assigned to this attribute does not match one of the kind categories, then abort these steps. Update this attribute to the new value. If the sourceBuffer attribute on this track is not null, then queue a task to fire a simple event named change at sourceBuffer.audioTracks. Queue a task to fire a simple event named change at the audioTracks attribute on the HTMLMediaElement. Allows the web application to get and update the track language. If the value being assigned to this attribute is not an empty string or a BCP 47 language tag[ BCP47 ], then abort these steps. If the sourceBuffer attribute on this track is not null, then queue a task to fire a simple event named change at sourceBuffer.videoTracks. Queue a task to fire a simple event named change at the videoTracks attribute on the HTMLMediaElement. If the value being assigned to this attribute does not match one of the text track kinds, then abort these steps. If the sourceBuffer attribute on this track is not null, then queue a task to fire a simple event named change at sourceBuffer.textTracks. Queue a task to fire a simple event named change at the textTracks attribute on the HTMLMediaElement. If the value being assigned to this attribute is not an valid text track language, then abort these steps. The bytes provided through appendArrayBuffer() and appendStream() for a SourceBuffer form a logical byte stream. The format of this byte stream depends on the media container format in use and is defined in a byte stream format specification. Byte stream format specifications based on WebM , the ISO Base Media File Format, and MPEG-2 Transport Streams are provided below. These format specifications are intended to be the authoritative source for how data from these containers is formatted and passed to a SourceBuffer. If a MediaSource implementation claims to support any of these container formats, then it must implement the corresponding byte stream format specification described below. The number and type of tracks must be consistent. Track IDs do not need to be the same across initialization segments if the segment describes only one track of each type. Track IDs must be the same across initialization segments if the segment describes multiple tracks of a single type. (e.g. 2 audio tracks). An ISO BMFF initialization segment is defined in this specification as a single Movie Header Box (moov). The tracks in the Movie Header Box must not contain any samples (i.e. the entry_count in the stts, stsc and stco boxes must be set to zero). A Movie Extends (mvex) box must be contained in the Movie Header Box to indicate that Movie Fragments are to be expected. Valid top-level boxes such as ftyp, styp, and sidx are allowed to appear before the moov box. These boxes must be accepted and ignored by the user agent and are not considered part of the initialization segment in this specification. An ISO BMFF media segment is defined in this specification as a single Movie Fragment Box (moof) followed by one or more Media Data Boxes (mdat). Valid top-level boxes defined in ISO/IEC 14496-12 other than moov, moof, and mdat are allowed to appear between the end of an initialization segment or media segment and before the beginning of a new media segment. These boxes must be accepted and ignored by the user agent and are not considered part of the media segment in this specification. This section defines segment formats for implementations that choose to support MPEG-2 Transport Streams (MPEG-2 TS) specified in ISO/IEC 13818-1. MPEG-2 TS media and initialization segments must conform to the MPEG-2 TS Adaptive Profile (ISO/IEC 13818-1:2012 Amd. 2). Segments must contain complete MPEG-2 TS packets. Segments must contain only complete PES packets and sections. Segments must contain exactly one program. An MPEG-2 TS initialization segment must contain a single PAT and a single PMT. Other SI, such as CAT, that are invariant for all subsequent media segments, may be present. PSI that is identical to the information in the initialization segment may appear repeatedly throughout the segment. The media segment will not rely on initialization information in another media segment. Media Segments must contain only complete PES packets and sections. Each PES packet must have a PTS timestamp. PCR must be present in the Segment prior to the first byte of a TS packet payload containing media data. The presentation duration of each media component within the Media Segment should be as close to equal as practical. A random access point as defined in this specification corresponds to Elementary Stream Random Access Point as defined in ISO/IEC 13818-1. Each time a timestamp rollover is detected, 2^33 must be added to MPEG2TS_timestampOffset. When a discontinuity is detected, MPEG2TS_timestampOffset must be adjusted to make the timestamps after the discontinuity appear to come immediately after the timestamps before the discontinuity. When abort() is called, MPEG2TS_timestampOffset must be set to 0. When timestampOffset is successfully set, MPEG2TS_timestampOffset must be set to 0.